Public pressure has forced legislators to act in the aftermath of a violent act of animal cruelty in which a man set fire to eight puppies in front of his two young daughters. 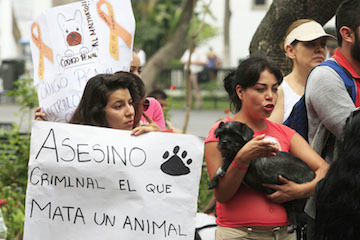 Animal welfare activists held several demonstrations this weekend culminating Monday with a protest outside the State Congress building in downtown Guadalajara. Most of the demonstrators carried banners or signs demanding tougher penalties for animal cruelty. Some brought their pets with them to the protest. Hernan Cortes, president of the Legal and Constitutional Affairs Committee in the Jalisco Congress, said Monday that changes to Article 15 of the State Constitution, that would pave the way to a subsequent modification of the penal code, could be brought to the house floor as early as Thursday. If the changes are approved, Cortes said, Jalisco would become the first Mexican state to include comprehensive and specific laws regarding animal abuse in its constitution. Intentionally killing a dog or a cat is a criminal offense in all U.S. states. Cortes said the law will include the concept of "animalicidio" – a word used to signify the deliberate killing of an animal. The man responsible for the death of the eight puppies faces a maximum 60,000-peso fine from Zapopan city hall for breaching municipal ordinances. He and his family fled Colonia Tabachines this weekend after animal welfare groups vowed to protest outside his house. Some of those demonstrating in Guadalajara Monday also called on the state government to go further and ban cockfights, bullfights and remove horse-drawn carriages (calandrias) from the city center.